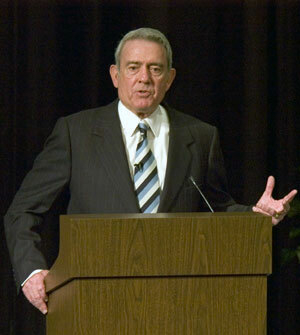 CBS anchor Dan Rather returned to Sam Houston State University in April to help celebrate the 125th anniversary of the university's founding. Concerning his planned retirement, SHSU president James F. Gaertner Tuesday called him a "brave reporter and anchor." While some were expecting Dan Rather tostep down as anchor for the "CBS Evening News," others were surprised to hear Tuesday's announcement. Rather, who replaced Walter Cronkite in 1981 has battled through triumph and tragedy, success and controversy, and after nearly a quarter century, Rather will become a correspondent for both editions of "60 Minutes." Rather graduated in 1953 from Sam Houston State Teachers College, and over the years, moved up the television ranks, starting his television career as news director of KTRK-TV in Houston. The news of Rather's resignation spread around Huntsville quickly Tuesday. People here said Rather was a real professional. From his days at KSAM Radio to his 42-year stint with CBS, Rather has always had a nose for news.
" He's been a very brave reporter and anchor in many ways," SHSU President James Gaertner said. "My wife and I have gotten to know him personally, and he is one of the most gracious men I have ever met. He is a fine gentleman and has had a truly outstanding career." Not only was Rather's character spoken highly of here, but his attachment to his school was as well. SHSU public relations director Frank Krystyniak said he will never forget how Rather was always willing to help out the university, whether making visits to the school or helping them out with promotional material.
" He has always been very proud that he graduated from Sam Houston State Teachers College," Krystyniak said. "He has always been very helpful when we've asked him to do things, like recruiting videos - we've sent scripts there that he would read and tape on the set of CBS news - and he has come back many times for things like commencements, the 200th birthday of Gen. Sam Houston, and he came back recently for the 125th anniversary celebration in April." Rather has drawn a large amount of criticism recently for a report he made about President Bush's National Guard service. Unfortunately for Rather, his report was based on allegedly forged documents, which drew the ire of people all over the country. Gaertner said even though Rather made that mistake, it still does not tarnish his legacy as a whole. When looking at Rather, he chooses to look at the newsman's entire career, not just one incident.
" I think that when people look back on his career, that will be a very minor part of it," Gaertner said. "You shouldn't be evaluated on your worst day. He might have made a mistake there, but taken in total, his career has been remarkable." SHSU journalism professor Hugh Fullerton said that since Rather did an outstanding job throughout his lengthy career as an anchor, it is unfortunate to see him step down after that recent controversy.
" The man is a great newsman," Fullerton said. "It's too bad that he had to end on a kind of ignominious note, but show me someone in the news media who has never made a mistake." With the National Guard report coming just months earlier, the question arises of whether or not the incident led Rather to this decision. Rather has said that discussions with CBS about the move began in 1999, but after the terrorist attacks on Sept. 11, 2001, the discussion was put on hold. Talks picked back up over the summer of 2004, and it was agreed that the change would take place March 9, 2005, 24 years after he took over for Cronkite. Krystyniak believes the recent controversy did not have any effect on Rather's decision. From what he saw during Rather's April 2004 visit to SHSU, thoughts of the change were taking place before the National Guard controversy ever happened.
" When he was here in April, he had a news conference with students," Krystyniak said. "In the news conference, one of the students asked him if he was planning to retire. Based on his answer, and I've told many people this since that time, I felt he was going to retire after the election." Gaertner's most fond memory of Rather is from just six months ago, when he returned to his alma mater to celebrate its 125th anniversary. With Rather's recognition and prestige, students, faculty and staff from all over the university wanted to meet the man whose name graces the communications building. Friday night, after the President's Dinner and Concert, there was a long line of people wanting to meet Rather. Gaertner said that even though Rather had to tape in New York the next day, he stayed until the very last person was able to meet him.